This is mentioned in connection with the southeastern boundary of Judah (Num. xxxiv. 4; Josh. xv. 3; Judges, i. 36). It is probably one of the passes which lead from the northern slope of the great Wadi-el-Fikre to the desert plateau and which afford communication between Edom and Judah. Though it is not possible to identify it absolutely with any particular pass, the suggestion that it is identical with the Nakb-el-Safa has two points in its favor; viz., (1) the evident antiquity of the pass, and (2) the traces of a path cut in the rock (Robinson, "Researches," ii. 120). 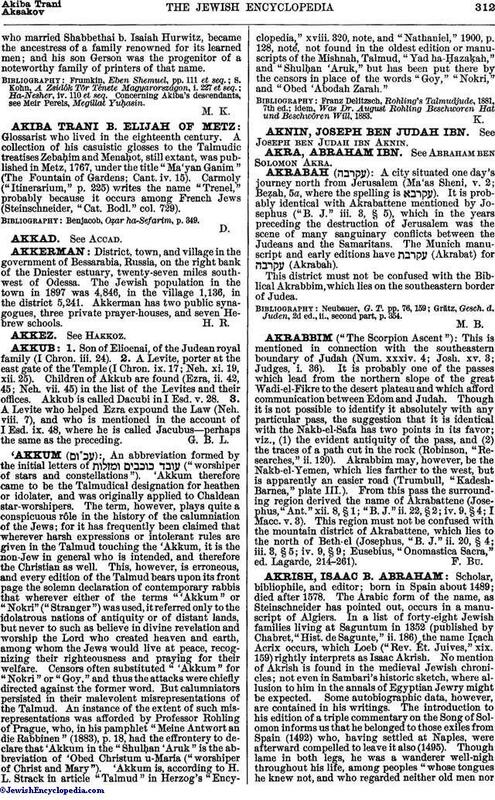 Akrabbim may, however, be the Nakb-el-Yemen, which lies farther to the west, but is apparently an easier road (Trumbull, "Kadesh-Barnea," plate III.). From this pass the surrounding region derived the name of Akrabattene (Josephus, "Ant." xii. 8, § 1; "B. J." ii. 22, § 2; iv. 9, § 4; I Macc. v. 3). This region must not be confused with the mountain district of Akrabattene, which lies to the north of Beth-el (Josephus, "B. J." ii. 20, § 4; iii. 3, § 5; iv. 9, § 9; Eusebius, "Onomastica Sacra," ed. Lagarde, 214-261).